Constipation is defined as having a bowel movement fewer than three times per week. With constipation stools are usually hard, dry, small in size, and difficult to eliminate. Some people who are constipated find it painful to have a bowel movement and often experience straining, bloating, and the sensation of a full bowel. Some people think they are constipated if they do not have a bowel movement every day. However, normal stool elimination may be three times a day or three times a week, depending on the person. Constipation is a symptom, not a disease. Almost everyone experiences constipation at some point in their life and a poor diet typically is the cause. Most constipation is temporary and not serious. Understanding its causes, prevention, and treatment will help most people find relief. Constipation occurs when the colon absorbs too much water or if the colon's muscle contractions are slow or sluggish, causing the stool to move through the colon too slowly. As a result, stools can become hard and dry. Inadequate Diet — Often constipation is simply the result of "not enough": not drinking enough fluids, not including enough fiber in our diet. Other times, constipation is the result of just "too much": too much intake of unhealthy or processed foods. Medication — Many people are unaware that constipation is also associated with many prescription and over-the-counter drugs (See list below). Ignoring Bowel Movements — Ignoring the urge to move your bowels - perhaps because it's inconvenient at that particular moment, or you're not at home - is another common cause of constipation. Children often ignore the urge to go to the bathroom because they are busy playing or in an unfamiliar setting. What happens when you ignore the signal to go to the toilet? Too much water is absorbed in the colon, and the stool becomes hard and dry, making a bowel movement more difficult. Over time, the nerves tend to stop sending your brain the message "it's time to go" and the bowel becomes constipated. 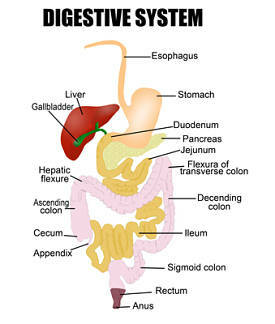 Over 150 prescription and many commonly used over-the-counter medications can disrupt your digestive system. Medications associated with constipation include antacids, antidepressants, opioid containing cough medicines, cold medicines, anti-parkinsons medications, and pain relievers. Some medications used to treat anemia, high blood pressure, high cholesterol and various cardiovascular conditions, can also be associated with constipation. Sometimes constipation is just a short-term problem that occurs as your body adjusts to a new medication. In other instances, such as when you are taking a prescription medication, constipation is a side effect that usually will not lessen over time. By incorporating healthy habits into your daily routine, you can prevent constipation. Drinking water, consuming a high fiber diet, following good bathroom habits, and regular activity each contribute toward preventing constipation. Eat more Fiber - Found in many fruits, vegetables and whole grain breads and cereals, fiber helps your body develop soft, bulky stools. In addition to adding healthy fiber to your diet, try to avoid over-processed foods with little fiber, such as chips, pizza, ice cream, frozen dinners and instant potatoes. Drink Adequate Fluids - Keeping your stools soft and easy to pass requires plenty of fluids. Concentrate on drinking unsweetened fruit juices, herbal teas, and just plain water, as caffeine- and alcohol-containing beverages tend to dry out your system. Get Plenty of Exercise - Just a 20-30 minute walk or any other regular exercise can help prevent constipation. Check with your doctor before starting any new exercise regimen. What can I do about constipation will on the ITG Diet? Make sure you are consuming all of your vegetables on the plan. Make sure you are drinking your daily water requirements. Get some exercise, take a walk after you eat. If needed utilize ITG Colon-Lax. This is a gentle stool softener that cleanses and detoxifies the bowels. However, if the problem persist consult your physician.